They produce one of the purest sounds in music, they’ve spawned the most influential songs in the history of rock `n roll, and they’re the favorite for songwriters the industry over, but in the eyes of hard rock fans, acoustic guitars are still fighting for respect - on radio they’re equated with power ballads, in live shows they result in a sea of lighters, and unplugged sets have become nothing more than trendy sidebars during performances. 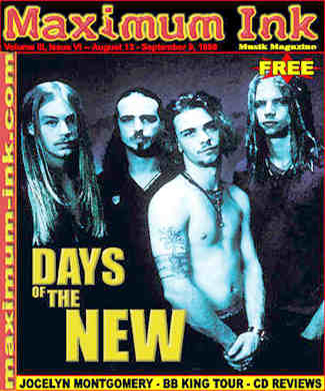 Enter Days of the New frontman Travis Meeks, whose acoustic guitar has meant a great deal more. It’s helped him earn a platinum album, one of the most coveted billings of the summer, and an opportunity to disprove the fallacy that unplugged bands can’t rock as heavy as their amped-up peers. An impressive list of accomplishments for a 19-year-old from Kentucky whose artistic vision projects far beyond his breakthrough commercial success. He does his own thing on Days of the New, venturing into the world of hard rock with an album that defies the conventional wisdom of the genre. After playing the local circuit in the metal outfit Bad Dreemz, pooling the influences of Pantera, Sepultura, Prong and Iron Maiden, ``I discovered a place that I didn’t feel was tended yet.” While DOTN has its moments that ring of unadulterated Alice in Chains, discerning listeners will notice Meeks’ songs building to an unexplored plateau, a lavish garden of underspoken acoustic construction, supple, driving melodies, and passionate vocal delivery. The results are intense, whether enjoyed for their subtle instrumental majesty, their more blatant lyrical realities, or the staggering juxtaposition of the two.